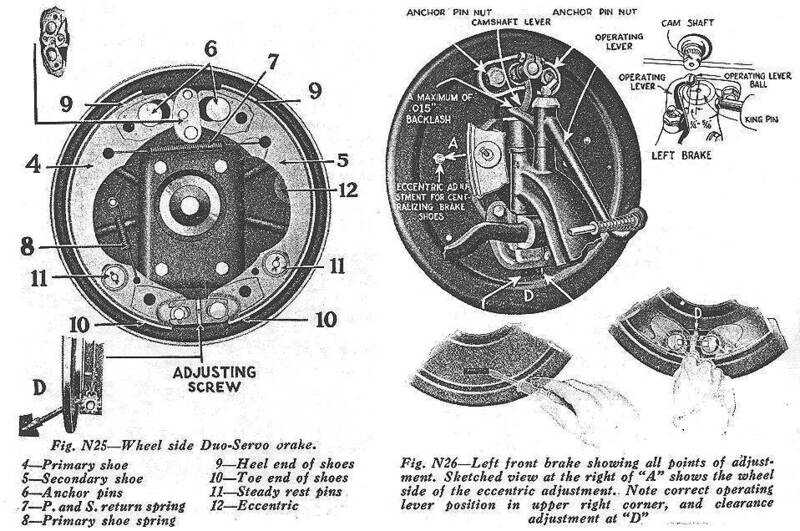 The Bendix "Duo-Servo" model brake is of the two shoe internal type mechanically operated. It differs from previous models of the same make in that it has equal energization in either forward or backward movement of the car, and also in the details of the shoe mountings and methods of adjustment. The two shoes in each brake assembly are identical in every respect and fully interchangeable. They are linked together at the lower end by a right and left hand threaded screw (D-Fig. N26) through articulating pins. At the upper end of the shoes are two anchor pins (6-Fig. N25), one of which serves as the anchor for braking in the forward direction and the other as the for anchor for braking in the reverse direction. (Some models have only one anchor.) The shoes are extended against the drums by means of a balanced cam (top of Fig. N25). Two cam trunnion blocks bear on the curved ends of the shoes and provide compensation for unequal lining wear. The right and left hand threaded screw (D-Fig. N26) which serves as an adjustment for clearance between the shoes and drum. The eccentric adjustment (A-Fig. N26) which centralizes the shoes in- the drum and prevents dragging when brakes are released. The anchor pins which enable centering of the operating cam to the shoes; the slightly elongated holes in the backing plate permit this movement of the anchors. The cam lever (Fig. N26) which is mounted on the serrated -camshaft allowing the lever to be moved to take up any wear in the linkage. The cable and conduit control used on some models of the Duo-Servo is adjusted in the same manner as the lever control previously described. The brake end of each cable is enclosed in a flexible conduit, thus eliminating the need for joints, etc., at the front and rear wheels. The cable type control is shown in Fig. N27, page 40. On those models of the two-shoe Duo-Servo brake provided with lever type controls the center of the operating lever ball end (at front brakes only) should be 1/4 to 5/16 in. behind the center line of the knuckle king pin (see Fig. N26) when the brakes are released. As linkage wear takes place the ball end of the operating lever will move forward to some extent. Any slight variation from the position mentioned above will not cause trouble, but if the hookup has been tampered with and the ball end (of operating lever) is far off position it will cause one of the front brakes to be applied when the car turns a corner. As before stated this is not a delicate adjustment but it is advisable to check same by turning the steering wheel to the full right turn position. Now apply the brakes about half way. If the front control Pievers are correctly positioned the left (outer) brake should be released with the right (inner) one showing drag. Now turn steering wheel to full left turn position, apply brakes and check right wheel which should be free with left showing drag. If the outer wheel does not release when tested as above it indicates wrong position of operating lever. which should be changed by moving the camshaft lever (Fig. N26) rearward on its serrations and readjusting the length o(. the front pull rod. Hookup linkage should be adjusted to just remove the backlash. Never adjust pull rods to take up lining wear. 1. Jack up all four wheels. Make sure that service pedal and hand brake lever are fully released. Loosen lock nut of the eccentric adjustment (A-Fig. N26) on all four brakes. 2. Rotate wheel by hand and at the same time turn the eccentric adjustment in the direction wheel rotates when car is moving forward, until a very slight drag is felt, then turn eccentric in opposite direction until wheel is just free. Now tighten the locknut. Do this on all four wheels. 3. Now adjust shoe clearance by turning the notched wheel with a screwdriver (in a direction so that top of wheel is revolving toward you) until r e drags slightly then turn notched adjuster in opposite direction until wheel is just free. See D, Fig. N26. Do the same to the other three brakes. 4. Try car on brake testing machine or road and if not perfectly equalized loosen notched clearance adjusting wheel (D, Figs. N26 and N25) on the tight wheel. If brakes are being relined or if the anchor pin nuts are found loose or if previous adjustment has failed to give satisfactory results apply the major adjustment. Major adjustment includes all of the work mentioned in paragraphs 1, 2 and 3 plus centering of the 8 shoe anchors. 5. Jack up all four wheels. Loosen the two anchor pin nuts (Fig. N26) until same are free of their lock washers. 6. Tighten clearance adjustment notched wheel as outlined in paragraph 3, but set each shoe up so tight that wheel can be just turned with both hands. Tap ends of both anchor pins with soft hammer, then tighten anchor nuts with a 16-in. wrench. Anchors must be set up very tight. 7. Now back off on the clearance adjustment (notched wheel) until road wheel is free of drag. 8. Recenter shoes by turning eccentric adjustment until wheel just drags, then back off until wheels turn freely, as outlined in paragraph 2. 9. Readjust shoe clearance by turning adjuster "D" until wheel just drags, then back off until drag is just removed. 10. Repeat 5, 6, 7, 8, and 9 on other three brakes. Try car on testing machine or road, making final equalizing adjustments at notched wheels "D," Figs. N25, 26. Whenever possible, it is advisable to check the lining to drum clearance with some form of measuring device. Recommended specifications call for approximately .008 in. clearance at the anchored (heel) end of shoes and about .014 in. at the unanchored or adjusting (toe) end of the shoes. Although these clearances vary with some linings, it is important to maintain the proper ratio, i. e., top ends of the shoes should have about half as much clearance as the lower ends.